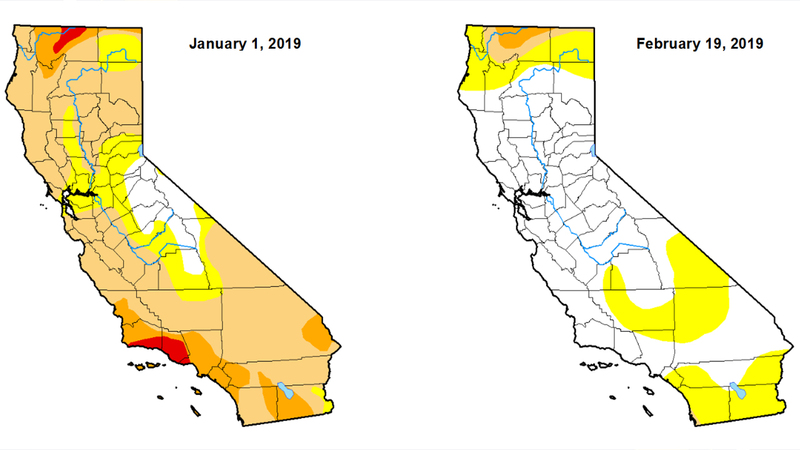 LOS ANGELES -- February storms have almost eliminated drought conditions from California. The U.S. Drought Monitor said Thursday that just over 67 percent of the state is totally free of any level of dryness. Just under 30 percent is classified as abnormally dry, and less than 4 percent remains in either moderate or severe drought. The drought conditions are confined to a far northern area along the California-Oregon border. Precipitation is continuing to fall Thursday as a cold but not very moist system impacts Southern California and showers linger on the Central Coast. Chances of rain return to Northern California during the weekend and early next week. If you would like to see the latest drought conditions across the country and side by side comparisons click here.